The End of an Era – Mark Loves History! Today in History, March 7: 1885 – After the Civil War Texas Cattlemen began driving their herds north across Indian Territory to railroad hubs in Kansas. For twenty years Kansas towns (Abilene, Dodge, Hays, etc) vied to be the main hub to reap the accompanying profits. 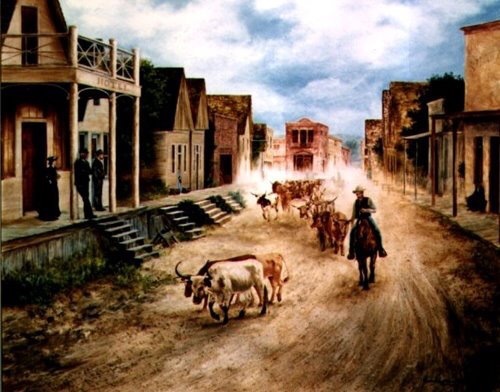 The cattle drives and the cowboys that led them became the source of our romance with the West. However by 1885 Kansas had become a mostly agricultural state, and the cattle herds destroyed crops, their cowboys were rowdy. On today’s date the Kansas legislature passed a quarantine restricting Texas cattle from Kansas except in the Winter months, when the diseases they carried were less likely to affect Kansas dairy cows. It was a moot point by then anyway, as the railroads had made their way into Texas cattle country.